Rated by major industrial manufacturers as the best product on the market for removal of stubborn, sticky substances with no damage to surface! Just spray on, wait 60-90 seconds for softening & lifting of adhesive, then squeegee-off for a totally clean surface (no gooey mess) and no stain or damage to surface or any paint (even lacquer paints). Removes adhesives/glues as well as: tar, hot melt, fork-lift scuff marks, grease, oil, tree sap, sealants, surface discoloration, inks, waxes, labels, stickers, duct tape glue, caulk residue and more. Safe on all paint finishes, metals, hard plastics, glass, fiberglass, marble, rubber and vinyl. Replaces dangerous xylene, MEK and lacquer thinner. User friendly - no harsh odor. Automotive, Industrial, Marine and Sign uses. Hands down: the best chemical formula to remove stubborn, sticky residues in seconds! Chemical resistant sprayer FREE with each quart bottle! Recommended by major companies world-wide. Available in 32 oz. spray bottle and 55 Gallon Drums for economy. Body Shops use it to remove adhesive left after decals, graphics & stripes are lifted - also to smooth-out seam sealer & remove paint sealant - also to blend the edges of coating overspray (primer, sealer or clear-coat coatings) - leaves an invisible blend and soft edge to every repair - ideal for use with medium and high-solids clear-coats.
" … Your product does a great job in removing the glue that is left when decals are removed from semi-trailers. Quick 'n Easy has reduced our glue removal time from an average of (4) four hours per trailer to approximately 45 minutes!..." …Quick ‘n Easy Heavy Duty Specialty Adhesive Remover is the only product we’ve found that easily removes fork-lift tire scuff marks from our urethane coated floors with no damage… products we sell to Wal-Mart stores wont do the job! No scratch brilliant shine on any type of wheel, metal or hard plastic! Leaves a long-lasting clear protective barrier that retards tarnish, oxidation and dullness. Easy-to-use shop application fluid that prevents damaged emblems, decals, stripes & graphics - also eliminates bubbles, wrinkles, tears & holes! Cleans & Prepares the surface without leaving any residue, it then "floats" the vinyl providing ample time to re-position (straighten) graphic, and then it chemically activates the adhesive to create a strong bond between surface and graphic without need for heat gun or lamp. Allows faster, easier release of the graphic cover tape. One formula covers all grades of vinyl and performs in extremely cold temperatures or high humidity with no lifting, bubbles or wrinkles. Foolproof - even an inexperienced installer will get a uniform, straight & bonded decal/graphic with first application. Available in ready to use 32 oz. spray bottle, economy Gallons and 55-Gallon Drums for volume users. Body Shop Safe - no silicones, does not stain paint, user friendly neutral odor and safe to use. "... only product that truly works... mandated all our plants order 55-gallon drums... "
" … I tried the Decal-Graphic Solution and I've never in 20 years found anything like it - beats any solutions or mixtures I've ever bought or mixed! …"
"... when our cars are traveling around the track at speeds in excess of 150 mph, we have to be certain the decals and emblems don't fly off!... the adhesion we get with your Decal-Graphic Solution guarantees no lifting even at extreme speeds... "
Fast Acting Formula Kills Rust & Paint Ready in 20 to 30 Minutes! A new twist to an old product! 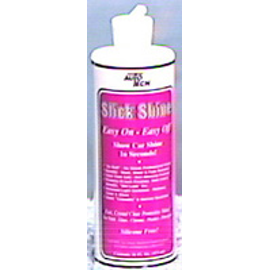 This fast acting formula kills rust on contact and converts it to a dry, paintable surface in 20-30 minutes, as opposed to the normal 8 - 12 hours required by other products. Also, this unique formula is actually two products-in-one: it kills/converts rust or, if sprayed on a bare rust-free panel, it etches the surface like a metal prep and creates the perfect surface for paint, primer or filler! Rust-Prep works by reacting with rust to form a chemically inert ceramic-like strontium phosphate film that becomes part of the surface. When primed or coated, adhesion to the surface is increased because the zinc strontium phosphate film is cellular and actually creates a locking effect at the paint interface thus going way beyond ordinary adhesion. And the zinc phosphate film results in superior anti-corrosion and welding conductivity. 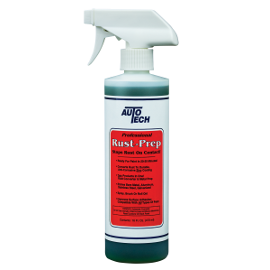 Rust-Prep prevents rust bleed through and also removes scales and corrosion from aluminum, galvanize, copper, stainless steel, fiberglass and wood. Rust-Prep dissolves lime and scales from pipes, evaporators, engine cooling systems, etc. and it bleaches rust stains from wood, vinyl, ceramic, porcelain, grout, glass, brick, cement etc. Rust-Prep has hundreds of uses - if rust or rust stains are the problem, Rust-Prep is the solution! Approved for: Industrial, Marine, Agricultural, Auto, Truck, RV uses. Available: 16 oz. 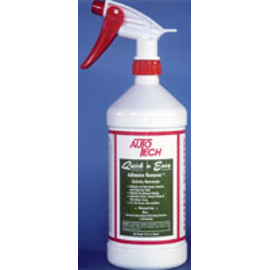 Trigger Spray Bottle, 64 oz. Economy Refill and 55-Gallon Drums for volume use. "… Just a short note to rave about Rust-Prep. This product is all the things it claims to be and more!… The very best feature for those of us with production-minded schedules is the 20-30 minute drying time as opposed to hours of waiting for a dry, workable surface… "
" ...Bare metal needs protection right away to prevent rust from forming. 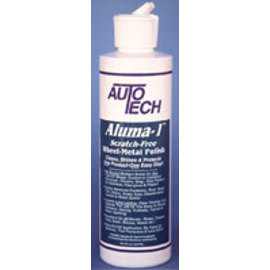 Tommy used Auto Tech's Rust-Prep, a product that leaves behind a zinc phosphate coating to discourage rust from flashing on the metal surface ... "
An O.E.M VOC approved water-based industrial strength cleaner/degreaser that is non-flammable, non-toxic and environmentally safe. 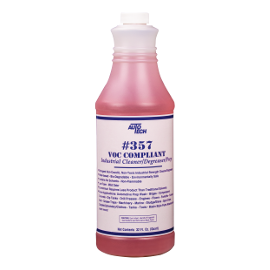 Not an ordinary cleaner and stronger than citrus-based cleaners, #357 offers far superior performance -- it will clean/degrease the nastiest jobs, yet is safe to use and is economical because it dilutes with water. CARB Compliant VOC is: 0.5 % as determined by EPA #40 CFR 51.00 Method 24 Calculation. Available in concentrated 32 oz. bottles, economy Gallons and 55-Gallon Drums for volume users. This unique formula contains a patented ingredient that eliminates odors caused by: cigarette & cigar smoke, fire damage, sweat, mildew, pets, vomit, skunk, urine, dead animals, fishing gear and other persistent, offensive organic odors. Numerous Uses: Automotive, hotel/motel, RV's train/plane, marine, restaurant, apartment, air conditioning, animal kennels, veterinarian, bathroom, storage room, janitorial, industrial, public building, office, home - anywhere instant odor elimination is needed. One container economically removes all odors from an entire vehicle, room or area. Can also be used for Spot Release on specific areas such as carpets, seats, pet bedding, etc. Body Shops report Auto Tech's Odor Eliminator removes the interior chemical resin smell that results from paint & body work - they simply "fog" the vehicle interior so the seats, headliner & floor mats are odor-free for customer pick-up... and the beauty of it is: the body shop adds the cost of the can under the clean-up section of the estimate! Approved by Penske Truck Leasing for use in their trucks and vehicles nationwide!
" ... Just wanted to let you know your Odor Eliminator is phenomenal! ... 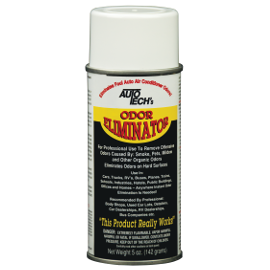 Some of our trucks have 700,000 miles on them - my drivers smoke, so the interior odor use to be terrible - and it even got worse as it built-up ... We tried other products, but they don't run thru the ventilation system like yours, so they only cover the odors temporarily ... Auto Tech's Odor Eliminator finally solved our problem! ..."
"... this product makes money for us because it helps us sell the trucks on our lot ... here is another order for 3 cases ..."
"... we constantly run into cars & trucks with unusual smells and odors... we tried your "Odor Eliminator" on a late model Ford Ranger pick up with a heavy cigarette smoke smell... All I can say is your product did what my detail shop couldn't do! 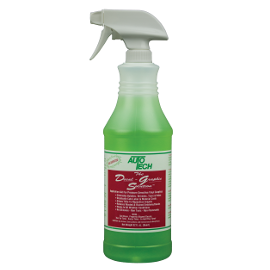 It totally got rid of the odors... "
Plastics, metals, rubber, vinyl, Formica, marble - all painted and unpainted hard surfaces are fair game with this light maintenance cleaner/polish. Just spray on, wipe off dust, fingerprints, smudges etc. - then check out the ultra-smooth, high gloss finish. Contains no silicones or wax, so will not streak or smear, even in full hot sun, even on glass and chrome! Safely removes surface contaminants without scratching and leaves anti-static, invisible clear coating that resists dust, grime etc. Liquid has a pleasant fragrance and is non-toxic and environmentally safe. Perfect for: eye and sun glasses, computer screens, windows, equipment, tool cases, office furniture, fixtures, automobiles, trucks, airplanes, boats, sinks, counter tops, appliances, musical instruments, janitorial maintenance, casinos, restaurants, hospitals and any hard surface. Customers stand back and say: "WOW- what a great product!" Body Shops love this product because: no silicones or wax - Works on fresh paint - Does not affect cure - Safe and effective on all paint finishes, including clear coats - Lubricates final glazes for a higher, brighter finish - Great after fresh paint buff-out (leaves rest of vehicle looking as good as the area just repaired) - Perfect substitute for silicone lubricants commonly used with over-spray clays. Guaranteed to not streak or smear, even in direct hot sun on dark finishes (others may claim no streaks, we prove it!) Safe and perfect as a "dry wash" Spectacular results on any hard surface including: rubber, plastic, glass (windshields), all paints, window-tint, vinyl, hard woods etc. The ultimate Body Shop spray!Available in 16-oz. Spray bottle, economy gallons and 55-gallon drums. "… WOW is the best … I use and endorse it wholeheartedly! …"
Recently ranked as one of the fastest growing franchises in the USA, Colors on Parade (Total Car) recommends and supplies only one quick finish product to all its franchisees nationwide: Auto Tech's WOW! The Ultimate Polish ... Why! ... Because it's proven to be the best in quality and performance! "... the chrome is the easiest part of the car to maintain ... People think the chrome is made of decals, but it's real polished aluminum ... The secret is a spray cleaner-polish called WOW! made by Auto Tech ... We order it by the case ..."
"... We have our own unique hand rubbed satin finish that our sons do to our high gloss polyester finished pianos. The WOW puts the final silky sheen on the finish, removing the slightly dusty look that hand rubbed finishes tend to have. Our customers always want to pet the pianos when we're done... We've been more satisfied with the WOW than with any other product sold in the piano industry... "
"... Several months ago we switched from Meguiar's "Final Detail" to your product, "WOW"... We have 70 cars on display at our museum... We think the cars look better and the good looks last longer with "WOW" than with the competing product... "
Safe, non-toxic, hypoallergenic, biodegradable, and fragrance-free cream dramatically improves and helps prevent dry, chafed and cracked skin. Non-greasy, non-sticky cream absorbs quickly and dries completely - will not affect your sense of touch or clog your pores. Conventional lotions only attempt to replace natural moisture with artificial moisture. This type of lotion comes off when you wash or touch something. In order for moisture to really do any good, it needs to get below the second major layer of skin and only natural moisture is going to reach that level. Unlike conventional lotions, Second-Skin will not wash off and helps retain natural moisture resulting in smoother skin that is not dry or cracked. Second-Skin "wears" off naturally with exfoliated skin cells. It also protects skin from irritants and harsh chemicals and protects hands that spend time in chemicals, water and detergents. All ingredients are accepted as safe by the FDA and USDA. Available in 8-oz Flip Top bottle. Categories for use include: Automotive, Artists (Paints/Ceramics), Aviators, Builders, Construction Workers, Cleaners, Cosmetologists, Emergency Services, Farmers, Florists, Food Services, Gardeners, Health Care Professionals, Homemakers, Lab Workers, Mechanics, Machinists, Marine, Painters, Plumbers, Photographers, Printers, Pest Control Operators, Pet Groomers, Veterinarians, and many more! Body Shops use Second-Skin to protect against damaging responses from the hazardous isocyanates found in automotive paints and to keep hands from cracking and drying (independent laboratory testing demonstrated that Second-Skin provides substantial protection against skin responses as well as systemic responses from isocyanates - lab report available)." ... operate an Aircraft Hydraulic Actuator Shop and the fluid used (Skydrol) is very unforgiving fluid which burns immediately on contact with skin and eats anything plastic or rubber based. Second-Skin gives us the protection needed to perform our job ... I recommend it to any aircraft mechanic who works anywhere near Skydrol ... it is a required item in my shop ... "
" ... love the protection and skin care your product provides for our students in the ceramic/pottery art department of the university ... "
NOTE: Second-Skin is not a substitute for required safety protection - gloves should be worn if safety regulations or instructions require glove use. However, applying Second-Skin to hands/arms prior to wearing latex or neoprene gloves will eliminate the skin irritation or allergic reaction that is commonly caused by these types of gloves. Second-Skin is totally safe and should be viewed as a second line of defense. Unlike typical polishes, this unique formula produces an outstanding, deep shine with easy-on, easy-off application! No buffing required, no streaking, non-abrasive and clear-coat safe. Formulated to meet the demands of today's new paint finishes: clear-coat, black, dark metallic and 'wet look' paints. Removes light oxidation, helps hide hairline scratches, durable and weather resistant. Excellent on: chrome, glass, fiberglass, acrylic and plastic surfaces, marble, porcelain, Formica and All quality paint finishes. Perfect for: autos, motorcycles, boats, RV's, airplanes, trucks, musical instruments, home uses, industrial plastic applications and much more. Available in 8 oz. Flip Top Bottle. Body Shops professionals prefer because it has no destructive silicones & is clear-coat safe. "…thank you for your Slick-Shine polish - our cars are turning heads in the streets! … I detail the cars and I've tried 3M's products, Mother's and Boyd's, and your Auto Tech products are first in their class!…"
"... writing this letter because I just can't believe how incredible your products are. I am definitely a detailing fanatic... I have tried everything on the market both commercial and mail order... Here is a list of what I have tried:...Mothers (all variations), Turtle Wax (all variations), Meguiers (their whole line and the some), Boyd's, Blue Coral (all variations), Wax Shoppe Super Glaze, Race Glaze, Blitz, Eagle 1 (all variations), Stoner, Dupont, Prestone, Liquid glass, Classic, Nu Finish, Simonize (all variations), Auto Armor, Blue & Black Diamond, Liquid Luster, Sur Luster and Zaino... YOUR SLICK-SHINE OUT PERFORMS THEM ALL!!!..." The original exterior formula that instantly removes unwanted wax and compounds from textured bumpers and trim. Penetrates deep into the textured plastic and dissolves the wax/polishes/compounds that can cause unsightly dulling and streaking. Deep cleans & renews faded color to any color rubber or vinyl in one-step application! 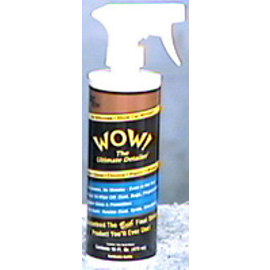 Leaves durable, long-lasting protection that is fade, water & salt-spray resistance.Great for boats: cleans & restores original color to oxidized, faded gel-coat fiberglass - creates a slick, water repellent surface. Great for pool/patio furniture: cleans & restores original, vibrant color to faded, discolored sun-bleached vinyl chairs, vinyl straps, cushions, umbrellas, hot tub covers etc. Great for signs: cleans and renews faded vinyl, plastic or rubber signs, vinyl awnings etc. Protects against further sun damage - extends the life of vinyl, rubber and plastic. Use On: Exterior vinyl tops, auto moldings, wiper arms, black metal, painted urethane bumpers, tires... use on all exterior vinyl, rubber, plastic, chrome, aluminum, fiberglass etc. Removes rubber "blooming". Available in 8-oz. Flip Top Bottle and economy 32 oz. bottle. The Body Shop paint professional's silicone-free choice for removing (not covering up) caked-on rubbing compounds, embedded wax etc. from textured trim & bumpers pieces. Recommended by major paint companies, I-CAR instructors and PPG Industries Training Department. "... Silicone-free moisturizer works best on bumpers... 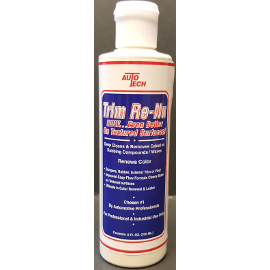 I was totally impressed with Trim-ReNu's ability to "wake up" exterior rubber, and as a bonus, it also removes old wax build-up..."